The goal of We Are Cardiff has always been celebrating the city of Cardiff through the stories of people who live here. Recently our (award winning – sorry, had to drop that in) blog was asked to be part of a campaign being launched by n0tice, which is a web platform that brings together hyperlocal news and events from various sites into one centralised place. The campaign that’s being launched is celebrating the British high street and its function in bringing together local communities across the UK. N0tice’s celebrate and change the highstreet campaign is being launched in four different UK locations – Cardiff, Edinburgh, Leeds, and Brighton. Revitalising city and town centre high streets as community hubs is an aspect of urban regeneration that we think is really important, and we’re delighted and really excited that n0tice have asked us to partner with them in promoting this new initiative here in the capital of Wales. So – what does this mean for you guys reading this? Well, we want YOU GUYS to take photographs of what you want to celebrate or change about your local high street. You can tweet them with the hashtags #celebrate or #change and the hashtag #myhighstreet, and the n0tice guys are going to be putting together a hub of all the online activity, which you can see at http://highstreet.n0tice.com. But it wouldn’t be fair to ask you to do ALL the work, right? So you can see below for two photographs of things that we’ve picked out as being things to celebrate and change. It’s a fairly obvious thing to point out about most urban centres these days, but there are increasingly more and more abandoned and empty buildings in these locations. It’s particularly sad when the buildings are old or have some sense of history behind them. Cardiff Bay has more than its fair share of these kinds of buildings (you don’t have to wander far from the bright sparkly lights of Mermaid Quay to find them either) – gorgeous old buildings that have been left empty, some for decades. The Coal Exchange, the Point, the Vaults (although these buidlings are being used sporadically). 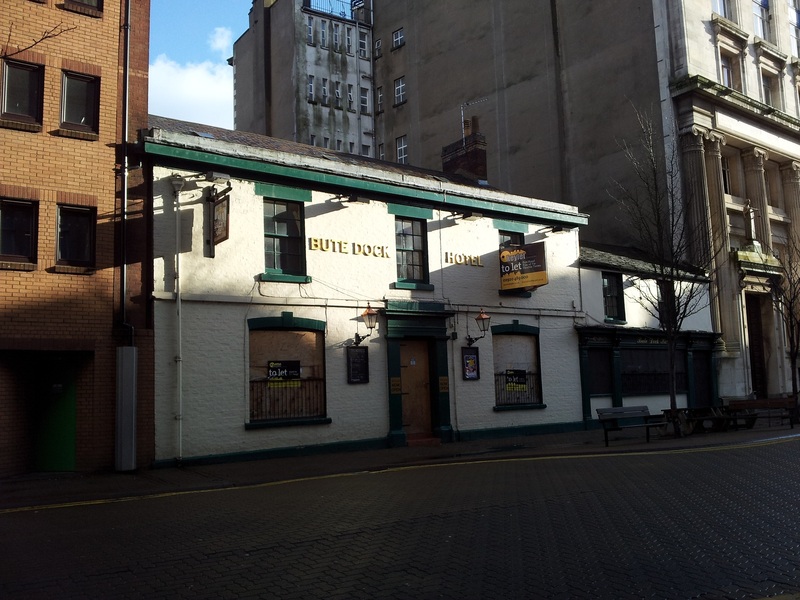 This photograph captures two things – another lovely old building that’s been left empty, but also another example of one of the 12 pubs that’s been closing (on average) per week over the past few years. So this is the question we put to you: what are the things you would like to #change or #celebrate on #myhighstreet? Tweet us your pictures with the hashtags and take part in this campaign that’s running over October and November 2012!